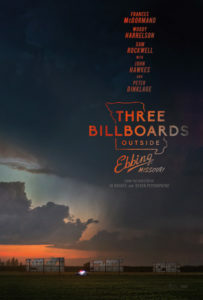 Martin McDonagh‘s latest — Three Billboards outside Ebbing, Missouri — is an angry film. In that, it feels more like his brother’s best film, Calvary, and much less like his previous film, the simultaneously leaden and manic Seven Psychopaths. 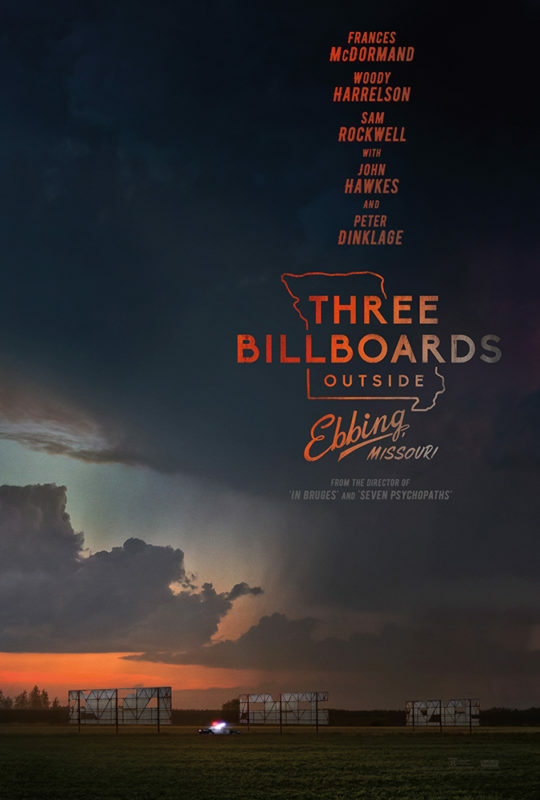 But while this one isn’t as good as In Bruges — likely the best film anyone named McDonagh will ever make — Three Billboards is actually quite good, depending upon which avenues you’re appraising it. Acting being the primary one I’d recommend. Frances McDormand takes the lead as the destroyed, ferocious, and — yes — angry mother whose daughter came to a brutal end most of a year ago. 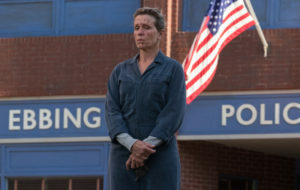 The local police force (including great roles for Sam Rockwell and Woody Harrelson) hasn’t yet cracked the case so McDormand’s Mildred puts up a string of goading billboards. 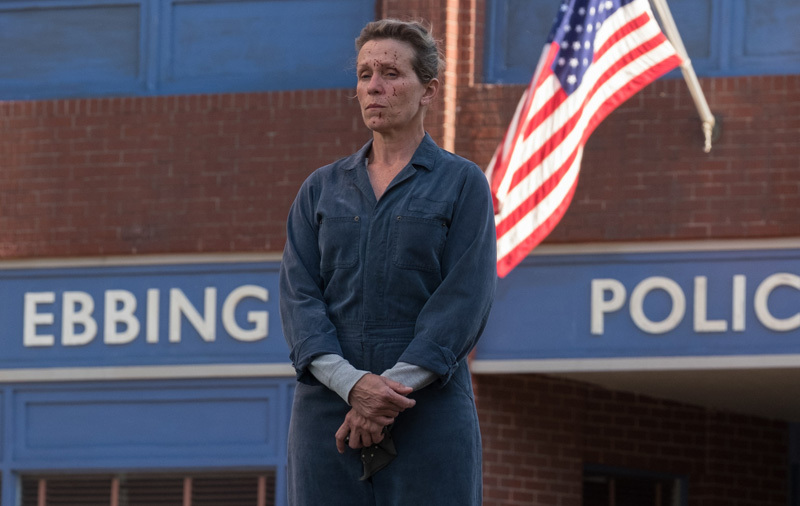 Despite this setup, Three Billboards isn’t about the mystery of who killed Angela. It’s more of a Twin Peaks ruse, if you will; a rusty nail upon which to hang an assortment of meaty, twisted, and — yes — angry characters. Did I say three paragraphs? Well, I lied. Frances McDormand is worth a paragraph on her own. Caleb Landry Jones, whom you might recognize from Twin Peaks: The Return or Get Out, also rises above the general level of excellence. And then there’s John Hawkes and Peter Dinklage and, in a generally appreciated bit of comic relief, Hugo Weaving‘s niece Samara as the too-young and un-smart girlfriend of Mildred’s ex. All fine actors, all gifted with some excellent dialogue to lay out like last week’s unrefrigerated deli tray. Speaking of which, these McDonagh brothers can write a speech or two. McDormand’s jovially accusatory undercutting of her local priest is a highlight, but there’s competition — I’m thinking specifically of Sam Rockwell’s dumb as rocks Officer Jason Dixon trying to explain how you can’t say “N****er torture” anymore, as that’s not right, despite the fact that he’s the guy guilty of doing the actual torturing. Then, like this review, Three Billboards outside Ebbing, Missouri just ends. Because it’s not about who killed Angela, or redemption, or anger management. It’s about the body-sized hole (and that analogy isn’t picked at random) that tempers cut through our lives. I could have been happy with more scenes and some more what’s next but I wasn’t unhappy, exactly, with the serving I got. On the whole, contended and not angry. Then I went to see Thor: Ragnarok and while, yes, it is funnier than most Marvel movies, if you want quiet Kiwi humor, for the love of all that’s holy see Taiki Waititi‘s Hunt for the Wilderpeople instead. That film is great. Waititi’s What We Do in the Shadows is also quite funny. Thor: Ragnarok, on the other hand, is just funnier than Avengers: The Age of Ultron and if that’s your standard for humor I believe I’ll decline to invite you to dinner.